A painting depicting wounded soldiers at Ypres during World War I has gone on show for the first time in almost a century. Ypres, 1915 by Gilbert Rogers is now on show at IWM North, part of Imperial War Museums, in Manchester. 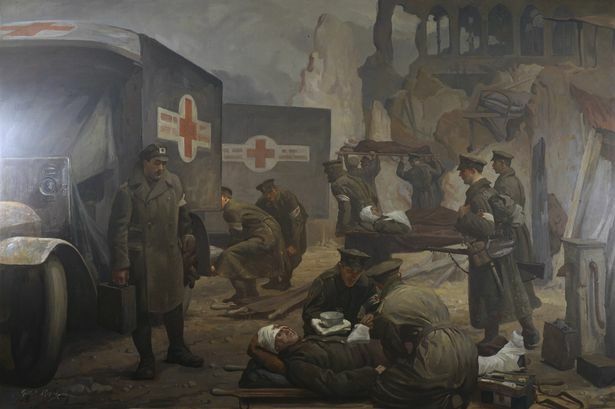 It illustrates the early work of the Royal Army Medical Corps (RAMC) and the British Red Cross Society (BRCS), who collected, transported and treated British soldiers wounded during the battles of Ypres in 1914 and 1915. Rogers was the lead artist commissioned in 1918 to produce works for the medical section of the newly formed Imperial War Museum. This particular work is more than 11 feet high and 15 feet wide and was one of several large canvasses displayed in IWM’s first home at the Crystal Palace, south London. The paintings suffered water damage from a leaky roof and remained rolled for many years until IWM was able to fund their restoration in the 1980s. Ypres, 1915 is now on show outside the main exhibition space at IWM North. Graham Boxer, Director of IWM North, said: ‘This stunning Rogers painting gives a reassuring image of quiet, well-ordered activity in Ypres, in contrast to the chaotic ruins in the background. This powerful image of ordinary people in extraordinary times is a fitting way to begin a major programme of exhibitions, displays and events marking the First World War Centenary. This entry was posted in Events and tagged 1914, 1915, Belgium, British Red Cross Society, Crystal Palace, Gilbert Rogers, IWM North, Manchester, news, RAMC, World War I Centenary, Ypres. Bookmark the permalink.